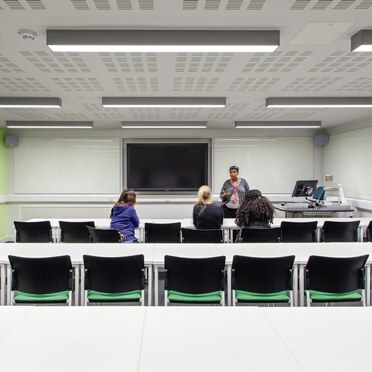 Thorn Lighting has created a solution for the redesign of the City, University of London that has resulted in a stylish installation, with maximum performance, low maintenance and high energy savings. 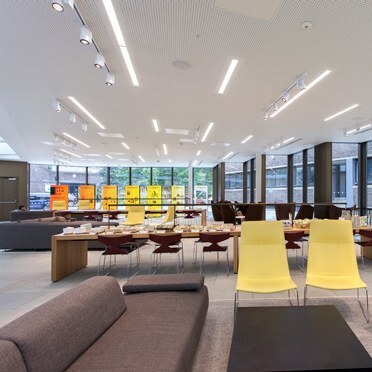 Working closely with Halsion Building Services Engineers, the lighting scheme has been transformed into an eye-catching, modern installation that works in harmony with the new, refreshed facility. City, University of London is a public research university based in the heart of London which contributes significantly to the Capital's academic, cultural and business life. The aim of the refurbishment was to create a new main entrance complex, improve circulation and expand student facilities at the Northampton Square main campus. Architects NBBJ worked closely with the University to transform the estate. The aim was to adapt the structure in a way that it stays true to its original concept. 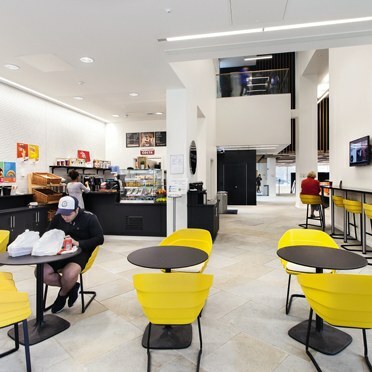 The scheme incorporated the main University building, the hub building and a new pavilion that integrates sensitively into the Northampton Square and Hat and Feathers’ Conservation Area. The design ‘celebrates’ the dramatic concrete structure of the original 1960s University Hall, now seemingly floating above the newly created arrival space. Converted into a Harvard style lecture theatre it offers carefully calibrated acoustics and natural light. 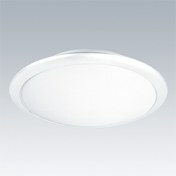 Thorn’s Equaline Linear LED luminaires light up the main areas of the building. The combination of sleek design and very good glare control, creates a pleasant environment for the students and teachers passing through the buildings. 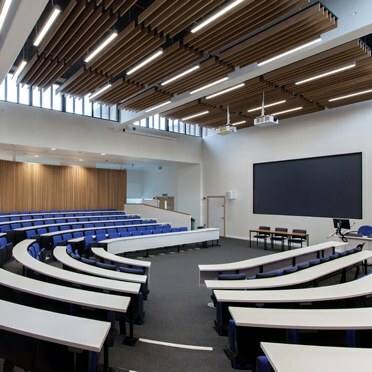 Equaline offers flexible mounting possibilities and the architects opted for recessed, surface mounted and suspended versions for the University. 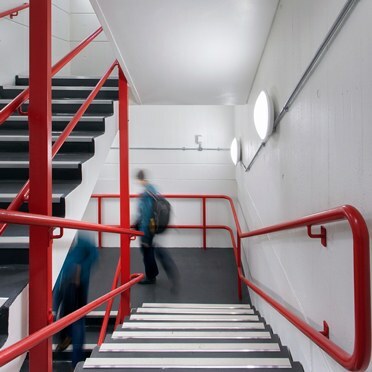 City, University of London is committed to embedding sustainability within all of its activities so for circulation areas, Thorn’s Chalice was an obvious choice as a direct LED replacement to conventional fluorescent downlights. The replacement does not only reduce energy usage by up to 60 percent but also reduces maintenance demands and therefore further costs. As a one for one replacement for single and twin T8/T5 fluorescent battens, Thorn’s PopPack LED has been installed in circulation areas. With a total load of only 28W, 41W and 60W, PopPack can achieve energy savings of up to 67% when compared to traditional switch start. Novaline, with its slim circular design, blends in perfectly with the building design and provides the right light levels for the stairwells. 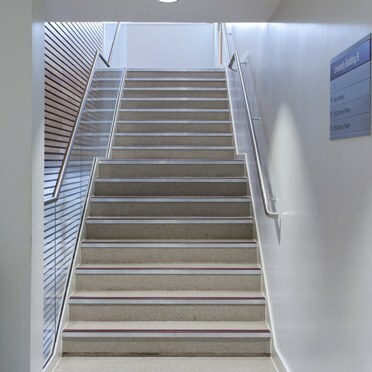 The ultra slim Voyager LED exit sign has been installed throughout the narrower areas of the University, providing guidance and safety. Easy to install, Voyager has a three hour duration of maintained or non-maintained operation and interchangeable legends. Thorn’s Olsys has been used for the illumination of the exterior of the facility, offering a wide range of configurations to suit the task and the environment. Designed in accordance with the EN 60598-2-13 contact temperature norm, Mica luminaires add additional illumination to the surrounding of the building. Ingo Braun, Design Director at NBBJ said: ‘‘By upgrading this iconic brutalist building and removing some of the accretions of past decades we’ve given it a new lease of life and secured its future within City, University of London’s main campus, opening it up to a growing and changing audience. The new entrance and route through the building has transformed the building and underlines City, University of London’s position as a leading, global institution."